As had been expected, a French-Spanish draft resolution addressing the situation in Syria was vetoed by Russia. The veto means civilians in Aleppo are likely to continue to suffer amidst heavy bombardment by Syrian and Russian aircraft. 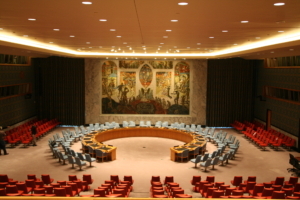 On Saturday, France and Spain presented a draft resolution on the situation in Syria to the United Nations Security Council. The resolution called for a cessation of hostilities, the establishment of a military no-fly-zone over Aleppo, unhindered humanitarian access, and holding perpetrators of atrocities accountable. However, as expected, the veto was vetoed by Russia. The Russian Foreign Ministry claimed the resolution distorted the reality of the situation in Syria, and that a ban on the aerial bombardments would provide cover to terrorists. The reality, that the resolution allegedly distorted, is that about 275 000 civilians are trapped by the siege of eastern Aleppo, suffering through daily bombings of bunker-buster bombs and incendiary weapons and starvation as aid convoys are blocked from entering the city. “Thanks to your actions today, Syrians will continue to lose their lives in Aleppo and beyond to Russian and Syrian bombing. Please stop now”, Matthew Rycroft, the British Ambassador to the United Nations, told his Russian counterpart Vitaly Churkin. Russia put forward a rival draft resolution, which constituted a version of the French-Spanish resolution with Russian amendments, such as leaving out the call for a military no-fly-zone. The Russian resolution only gained four votes in favor, well below the requirement of nine votes in favor. Saturday was the fifth time Russia vetoed a resolution addressing Syria since the beginning of the conflict in 2011. The first four times, the Russian vetoes where joined by China. On Saturday, the Chinese abstained their vote on the French-Spanish resolution, while voting in favor of the Russian resolution.